"A wonderful savory meatball and sweet sauce recipe that works as a main dish, or you can use just the meatball recipe part for parties. I recommend serving over white rice." Preheat oven to 400 degrees F (200 degrees C). Lightly grease a large, shallow baking sheet. In a large bowl, thoroughly mix the ground beef, eggs, bread crumbs and onion. Sprinkle with ginger, seasoning salt, pepper, Worcestershire sauce and sugar. Shape into one inch balls. 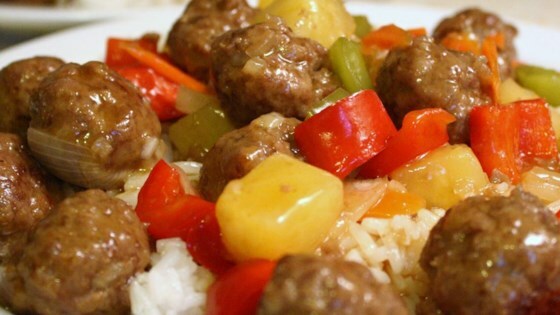 Place meatballs in a single layer on prepared baking sheet. Bake in preheated oven for 10 to 15 minutes; set aside. To make the sauce, mix enough water with the reserved pineapple juice to make 1 cup. In a large pot over medium heat, combine the juice mixture, 1/3 cup water, vinegar, soy sauce, and brown sugar. Stir in cornstarch, ginger and seasoning salt, until smooth. Cover and cook until thickened. This is an awesome recipe! I used premade meatballs which made it a little easier. I will add this to our family favorites. Quick and easy all the way!